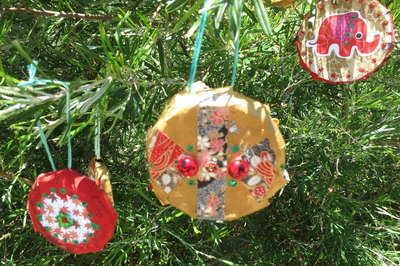 These sparkly up-cycled Christmas tree medallions are easy to make for children of all ages. To create some of your own, all you need are some lids from used jars and bottles, and a handful of other easily-procured craft materials. 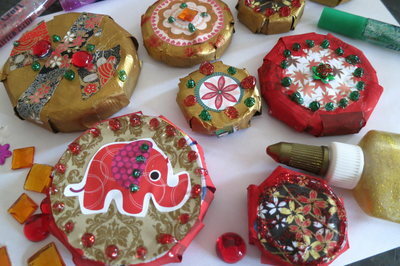 The lids are used as a base for the medallions, with children covering them firstly in layers of scrap paper, and then with bright shiny paper, acrylic paints and other glittery embellishments. Acrylic paint looks fabulous with this activity but remember that, if you choose to use a substantial amount, it might be a good idea to extend the activity over two days. This is because the paint needs at least an hour or two to completely dry. Otherwise, it’s difficult to glue things onto it. 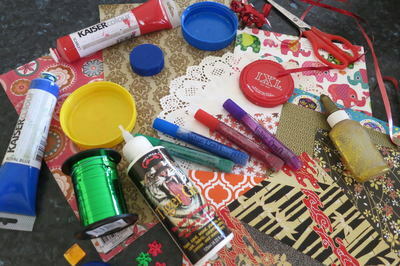 As a mixed media project, the possibilities with this activity are endless. Although I’ve chosen to use old lids as the medallion’s base, you could just as easily use other found objects such as small cardboard boxes, cardboard tubes (cut down to size), small containers or even pieces of cardboard. Once they’re decorated and up on your Christmas tree, they’ll all look beautiful. Lids of various sizes, to be used as the bases of your medallions – some of ours were quite small, while others, such as old peanut butter jar lids were fairly large. A few sheets of old newspaper to protect work surfaces from paint and glue. A variety of pretty, brightly-coloured paper for the outer covering of your medallions – this doesn’t have to be Christmas paper, but if you have some recycled (or new) Christmas wrap, this is great. Otherwise, any kind of paper can be effectively used – for example, craft paper, beautiful Japanese chiyogami paper or any other kind of brightly-coloured gift wrap. Gold or silver paper is particularly effective. If you have any old Christmas cards, you could also use some of the pictures from these. Acrylic paint in various colours – I used red and gold, but green, silver and other colours can also look great. Embroidery thread – red, green or gold is especially nice, but any colour will do. 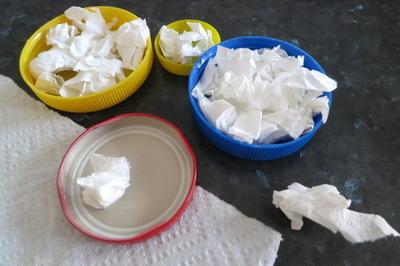 Take the lids and fill them with small pieces of tissue, paper towels or newspaper. Use craft glue to attach them firmly into place. You’ll need enough to fill the lids completely. These will help to provide a firm base for your medallions. If you’d prefer not to use paper, some alternatives are cotton wool or small scraps of fabric. 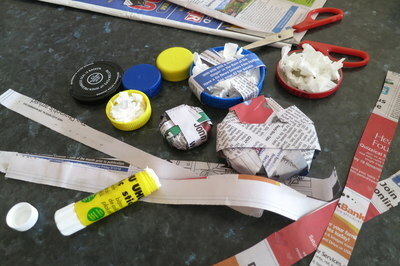 Cut pieces of newspaper or scrap paper, and glue them over the lids, as shown in the photo below. Initially, use larger pieces that will completely cover the lid, and then use smaller pieces. Keep doing this until each medallion has at least five or six layers of paper on it. Check each one to ensure that the lid is completely and securely enclosed. 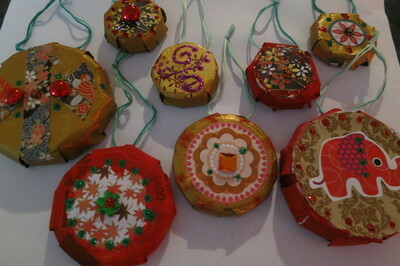 Take the sheets of pretty paper, and cut them into pieces to decorate your medallions. It’s a good idea to plan what kind of design you’re going to do on each one so you don’t waste anything. Alternatively, you might want to follow some of the simple designs that are shown in the photos below. As you can see, even a simple circle can look very effective. 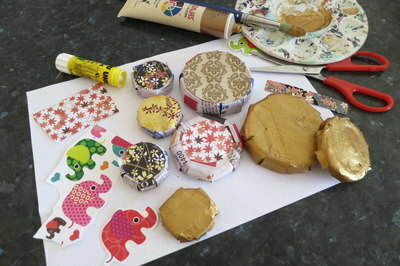 Start to glue the pieces of pretty paper onto the medallions. An alternative technique is to paint them in acrylic paint and leave them to dry. The painted surface can then be used as a base for the collage. 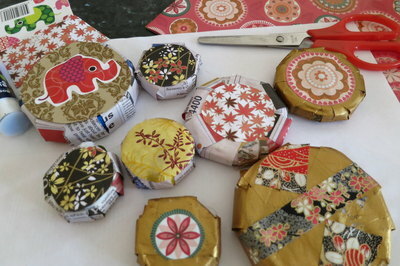 Continue to glue the pretty paper onto the medallions until you’re satisfied with the way they look. If necessary, gently tidy the edges so they look tidy. Add some acrylic paint, if desired. Red, green, gold and silver look especially nice. Allow the paint to dry. 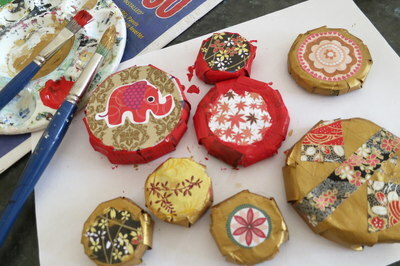 Use craft glue to attach glittery jewels and other decorations onto the medallions. Add some glitter and glitter glue to add an extra sparkly effect, and leave them to dry thoroughly. 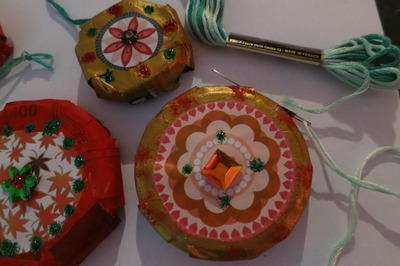 Thread a needle and sew through the edge of each medallion (through a few layers of the paper), as shown in the photo below. Measure a length of approximately 12 centimetres (or 5 inches) on either side of the medallions, and tie a knot. This will attach them to the Christmas tree. Your handmade Christmas tree medallions are now complete.